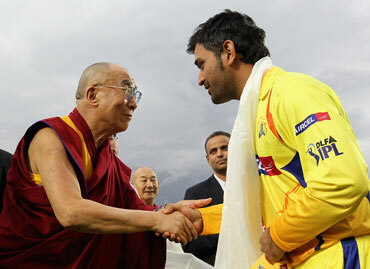 Players from both Chennai Super Kings and Kings XI Punjab received blessings from his holiness the Dalai Lama, who had come down to watch the match. The spiritual leader watched the game with great interest and also held a religious discourse with the players and franchisees on Saturday. Playing their second match at the Dharamshala ground, Chennai Super Kings won the toss and decided to field first. Captain Mahendra Singh Dhoni blasted a quickfire half-century to carry them to a thrilling six-wicket victory, in Dharamsala, on Sunday, and a berth in the semi-finals. 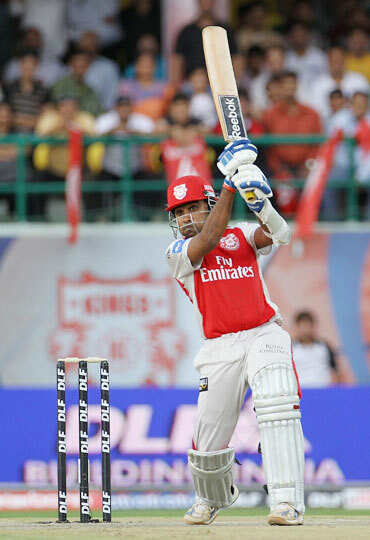 Punjab got off to a flying start, thanks to Mahela Jayawardena yet again. Jayawardene took the attack to the opposition straightaway, hitting consecutive sixes off Sudeep Tyagi in the first over. Shaun Marsh, at the other end, hit his first boundary when he smashed a short delivery from Dough Bollinger in front of square. Jayawardene then creamed Albie Morkel for three boundaries. But Morkel had the last laugh when he had Jayawardene brilliantly caught by Tyagi at mid-off after a quick-fire 21 off just eight balls. Skipper Kumar Sangakkara joined Marsh and did not allow the early momentum to drop. Chennai could have picked another wicket had Morkel not dropped Marsh at short-fine leg. Sangakkara was the aggressor of the two, as he pulled a short delivery from Bollinger to hit his first boundary. He then smashed young Tyagi for a couple of boundaries off his second over. Marsh too joined the boundary-hitting spree and hit Justin Kemp for consecutive fours as the duo soon put up their 50-run stand for the second wicket. However, just when the partnership was looking good for more, off-spinner Ashwin struck, cleaning up Sangakkara for a well-made 33 off 24 balls. Raina struck in the very next over and sent the dangerous Yuvraj Singh back to the pavilion for just one. 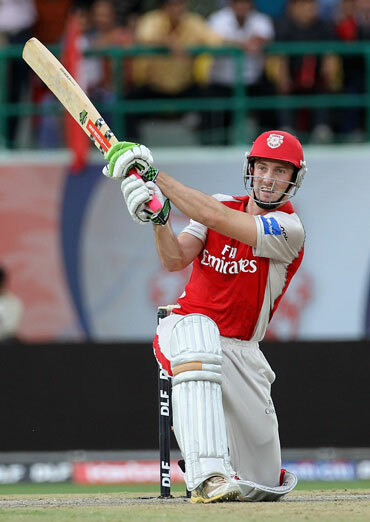 Marsh, who wasn't in good form in the series, showed what he is capable of with some big hitting. He opened his shoulders to left-arm spinner Jakati and slammed a boundary. He repeated dose in Raina's final over, giving the much-needed momentum, to post a well-deserved half-century. Irfan Pathan too joined the party, hitting boundaries off Ashwin and Morkel off successive overs. But the real fireworks came in the 19th over as Punjab plundered 19 runs off Bollinger. Marsh first hit a slower delivery from the Australian for maximum, and followed it with a straight six. Pathan added another six and boundary as the duo put on 99 runs off just 48 balls for the fourth wicket. Punjab finished at a competitive 192 for three in the stipulated overs. Chasing a mammoth 193 to win and seal a semi-final spot, Chennai were off to the worst possible start. Sangakkara started off with Pathan and Ramesh Pawar, and the spinner struck in the second over of the innings. Pawar first sent the dangerous Matthew Hayden back to the pavilion, having him brilliantly caught by Sangakkara, for just eight runs; he then had in-form Murali Vijay stumped for 13 as Chennai slumped to 27 for two. Suresh Raina, another batsman in good form, eased the nerves a bit with boundaries, first off Pathan and then off Powar. He then opened his shoulders and hit VRV Singh for a maximum, while S Badrinath opened his account of boundaries with a well-timed shot. Badri then hit Powar for a maximum, as the duo started to pull things back for Chennai. Sangakkara then introduced Piyush Chawla into the attack and he too was at the receiving end. Raina, however, missed out on a well-deserved half-century, as he unfortunately holed out in the deep after a well-made 46 off 27 balls. After Raina, skipper Dhoni stepped up to the occasion and kept the visitors in the hunt. Dhoni started off in his usual fashion, hitting Theron wide of long-on for a boundary. Theron was at the receiving end, as Badrinath picked 14 runs off his second over. Punjab's bowlers were not disciplined in the field either, giving free runs and also dropping chances. However, the wicket of Badri mean the onus was on Dhoni to see Chennai home. He was stumped by Sangakkara off Chawla after a well-made 53 off 36. Dhoni took over from Badri and showed why he is kown as one of the best finishers of the game. He hit Theron for a couple of boundaries in the 19th over, but was severe on Pathan, who he hit for two mammoth sixes to seal the game and power Chennai into the semi-finals.